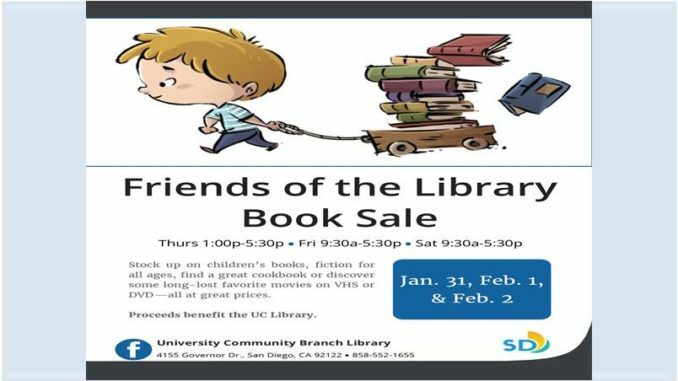 The Friends of the University Community Branch Library, 4155 Governor Drive, are sponsoring a Book Sale on Thursday, Friday and Saturday, January 31 through February 2, 2019. Stock up on children’s books, fiction, and non-fiction for all ages. Find a great cookbook or discover some long lost favorite movies on VHS or DVD. You may even find a game or puzzle or two – all at great prices. Proceeds benefit the University Community Library. Thursday, January 31 from 1:00 p.m. – 5:30 p.m.
Friday, February 1 from 9:30 a.m. – 5:30 p.m.
Saturday, February 2 from 9:30 a.m. – 5:30 p.m.
Qi Gong (Chi Gong) is a simple preventative health method of relaxing and harmonizing the body. These gentle exercises are suitable for any age and health condition. Friday, February 1, 8, 15, & 22 @ 9:30 – 11:30 a.m. Classics Book Club will be discussing Good-bye Mr. Chips by James Hilton. Monday, February 4 @ 3:30 p.m.
Accordion Club meets on the second and fourth Saturday of each month. All are welcome Saturday, February 9 & 23 @ 9:30 a.m. – 12:30 p.m.
University City Community Association – This is a community meeting featuring updates from law enforcement, fire-rescue service, legislative and other community leaders. All are welcome. Wednesday, January 9. Networking @ 5:30 p.m.; meeting @ 6:00 – 8:00 p.m. OASIS: Louvre and Prado – This lecture explores the world-renowned Musee du Louvre in Paris and Museo del Prado in Madrid. Artist Amanda Schaffer discusses and compares the history, architecture, and collection highlights of both museums. Friday, February 15 @ 12:30 p.m. Jewelry Making, take home something you made yourself! Make your own earrings and/or other pieces of jewelry with an experienced crafter. Space is limited, please call (858)552-1655 to RSVP. Friday, February 25 @ 10:00 a.m. & Noon. UC Book Club will be discussing Ellen Browning Scripps: New Money and American Philanthropy by Molly McClain. Wednesday, February 27 @ 2:00 p.m.
Zentangle, an introduction. This class will be an introduction to Zentangle. If you can draw lines and circles, you can Zentangle. Space is limited, please call (858)552-1655 to RSVP. Wednesday, February 28 @ 1:00 p.m.
Valentine’s Day Craft – Make a book with pop-out hearts that each have a message for someone special or maybe for your family. Decorate with hearts of all sizes and colors. Your own words and drawings make it special. Space is limited, please call (858)552-1655 to RSVP. Wednesday, February 13 @ 2:00 p.m.
LEGO Club – Come build anything you can image with LEGO. Thursday, February 14 @ 3:00 p.m.
Rainbow Blooms Pot Craft – Come and let’s make a home decor piece of craft. Roll up papers of different colors and make florets and arrange them in a Popsicle pot. Space is limited, please call (858)552-1655 to RSVP. Wednesday, February 20 @ 2:00 p.m.
Video Game Fridays – Come play video games on the Nintendo Switch with your friends. Friday, February 8, 15 & 22 @ 3:00 p.m.